What do you do when you know there’s an underground service in the area you are working, but you haven’t been able to find it using the standard digital locator? Well, you would be surprised how often this happens, and with more plastic (non-conductive) pipe going in the ground every day it is only going to get worse. So it is for this reason that Geelong Cable Locations invested in a high tech locating tool called Ground Penetrating Radar. In fact, the need for Ground Penetrating Radar has become that high that we have gone out and put a unit in each of our locating vehicles. This way every single job we go to we can get the GPR out and scan over the work site if needed. Ok, so what is Ground Penetrating Radar? Well, we are not going to get all technical on you here, for those of you that are engineers and want the science behind it all, here is the link to the Wikipedia page on Ground Penetrating Radar or GPR for short. But in layman’s terms, GPR is a non-invasive detection technique used to find underground services without disturbing the soil. It works by sending bands of electromagnetic radiation beneath the ground surface. These bands bounce off objects in the ground, which then show up on a radar screen. Now where the skill comes in is then interpreting that data you are seeing on the screen. It is for this reason that Geelong Cable Locations are the leaders in the industry. Unsatisfied with the training provided from the distributor and after trying several so-called GPR experts within Australia, Ben Minutoli, owner and manager of Geelong Cable Locations, flew over to America and completed training performed by GSSI the manufacture of radar themselves. Twelve month later Ben then sent staff over to be trained as well. On buying a different branded GPR being IDS, Ben has traveled to Pisa in Italy where it is manufactured. In fact here is a link to a video they filmed of him while there, warning it is pretty average. Speaking of videos, below is a video we shoot in which we locate a gas main and water main in the naturestrip. If you have never had Ground Penetrating Radar out onsite before, then I’d highly recommend you watch it to give you a guide to what it looks like in action. 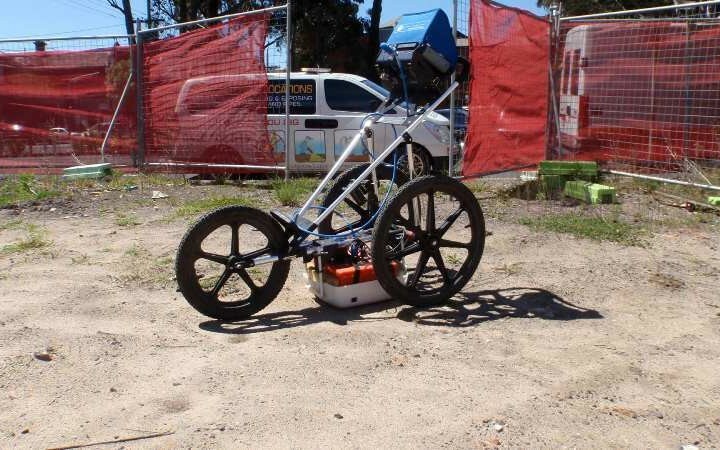 Now we need to add, when it comes to GPR, while it can yield good results, Ground Penetrating Radar is not always suitable because soil conditions and electrical conductivity in the area can impact on results. It can also prove to be time-consuming, as the operator may need to scan the area several times. So if you are looking for a particular service and digital locating hasn’t worked and now Ground Penetrating Radar hasn’t worked for you then the next options would be acoustic locating if it is a water pipe and we can get access to it. Here is a link to acoustic Locating. If it isn’t a water pipe or if we can not get access the pipe to hook the acoustic gear to it, then you will need to use Non-Destructive Digging. Here is a link to our NDD page that will hopefully help you understand how it works. Of course if you have any question about anything you have read or seen above then don’t hesitate to give us a call on 1800 449 543 or send us an email at info@localhost and we will be happy to try and help you out.